No other event equals the release of a federal budget for a clear statement of what the government really intends for the country. Almost everything else they do is smoke and mirrors. The budget tells us who or what the government favours, what they consider indispensable or sacred and what they wish to destroy. From a bigger picture perspective it also gives us some insight into their real vision for the future of the country… if they have such a vision that is. The budget is one of the few opportunities to see these lies exposed in print. So, what does the budget tell us about the Abbott government’s vision for Australia and how does that compare to their stated values? The much discussed $7 GP co-payment will, according to epidemiologists and doctors, lead to significantly reduced health outcomes, particularly for the poorest Australians. Despite the way it’s often reported, the Medicare co-payment is not supposed to repair the budget through increased revenue but by reducing the demand for medical services. The revenue will go into the medical research fund so it has no impact on budget deficits. GP visits are the early warning system of healthcare and are critical for effective prevention and early diagnosis of disease. Prevention and early diagnosis reduce health costs in the long run. The GP co-payments, therefore, will not only result in poorer health outcomes but are also very poorly targeted as a cost saving measure. It would be naïve in the extreme to think that the coalition government are not aware of these facts. If the GP co-payment is not about good health outcomes and is not about saving the government money, what is it about? The simple reality is that the Liberal party have always hated Medicare. They would love to destroy it but they cannot because it is so popular and so effective. The GP co-payment is just one blow in the death by a thousand cuts the Coalition intends to inflict on our universal healthcare system. Reduced federal funding for hospitals is another. Just like their Republican counterparts in the US who have so stridently opposed the introduction of a basic medical safety net, the Liberals are, at heart, social Darwinians. If you want something, pay for it yourself. If you can’t afford it then you don’t deserve to have it because you haven’t worked hard enough or tried hard enough. Hockey’s philosophy is “if you can’t afford it you don’t deserve to have it”. This underlying philosophy can be seen scattered throughout the rest of the budget. 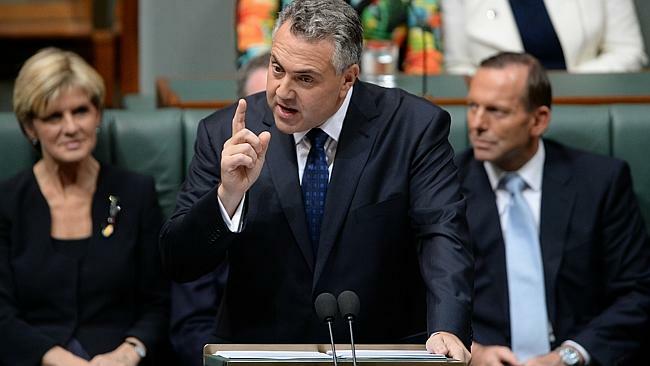 Joe Hockey has told us that everyone needs to do the heavy lifting for this budget. The exclusion of any long term measures that increase the contribution made by wealthy Australians tells us that Hockey and Abbott believe the wealthy already do enough heavy lifting and should not be further burdened. The people who need to contribute more are those in the middle and below but particularly the unemployed, the poor and the sick. Small details that together reveal the bigger picture are everywhere. Tradies will have to drag their weary bodies onto building sites until they are 70. If you’re under 30 and you lose your job you’ll have to wait six months before you can get the dole (what you’re supposed to live on during that time is anybody’s guess). All these changes are justified by the great lie that sits behind the 2014 federal budget; that there is a fiscal crisis that must be urgently addressed by cutting government expenditure. There’s no shortage of detailed commentary showing that this crisis is nine tenths fabrication but that doesn’t stop the government saying it nor stop many news outlets repeating it with a straight face. Abbott and Hockey are jealous of all the governments throughout the developed world who have a genuine economic crisis to use as an excuse to reduce the size of government. So what do they do? They create a fictional crisis here so that they can join in the fun. Are there long term structural problems with the budget that should be addressed? Yes. Is dramatic government cost cutting required to address these problems? No. This entry was posted in Australian politics, Economic theory, Inequality, political economy and tagged budget, Economic policy, inequality, politics. Bookmark the permalink. Well said Warwick. I enjoyed reading your article in The Guardian. It makes a lot of sense. We both share having spent time studying Philosophy in the Melbourne university. Both my daughter and I together gained a Super major in Philosophy. I graduated in 1993, with credits in Sociology from the University of Tasmania. I am a retired minister of religion in the Uniting church. Also studied for ministry in the United Faculty of Theology which is now part of the University of Divinity. I also gained a Doctorate in the practice of Ministry in The San Francisco Theological Seminary and University. I also have a blog, but not well used, “Intentionality a must” and can be found on Facebook by looking up Facebook William Spencer Aus. And also on linkedin. I was glad to come back home to Australia . My wife and I are involved in Marriage Counselling etc. My wife Joan is an accredited Mental Health Social Worker having a Social work degree from Melbourne University, and B.a degree with three majors, one of which is Psychology. We live in Hallam as our business is in Dandenong and Pakenham. Thanks for your comments. I loved studying philosophy at the University of Melbourne and it was the perfect antidote to studying economics there at the same time. Studying philosophy is all about asking questions and thinking. Studying economics at Melbourne uni, by contrast, was all about memorising and regurgitating. Asking challenging questions was actively discouraged. Amazing really.